Working with Jason has been a pleasure, he grasped the look and feel we needed and added some key points which made it better communication. 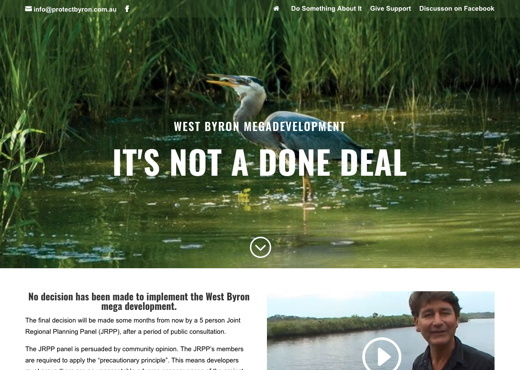 The image and concept elements of the Protect Byron website were created Alan Morden with content provided by a number of contributors. And the whole job was done quickly, with thought and IT technical skills provided by Jason Lasky of hubway and linked to both a Facebook site: protectbyron and an email address set up by Jason Lasky of hubway. Jason was prompt and helpful and worked creatively to make the project a success. Well done and many thanks.